It was the routine powercut. I was busy in the kitchen. TH was busy fixing something (for those of you who didn’t know, he’s the Mr. Fix-It of our family. There is nothing he cannot fix – from broken watches to mobile phones, the kitchen mixie to laptop. You name it, he can fix it!). With no TV and two pre-occupied parents, KT was getting bored and restless. So TH devised a plan! He spread a couple of news papers, asked her to sit on it, handed her a bowl and a huge branch of curry leaves and asked her to pluck the leaves. To my surprise, she accepted the chore delightfully. 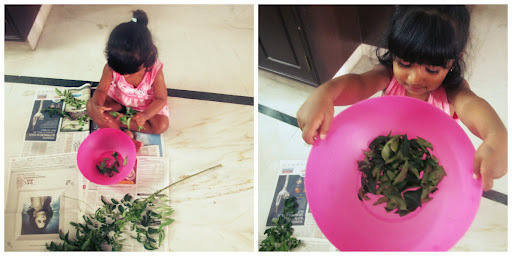 She sat there patiently plucking the leaves occasionally running to me with a handful of bare stems asking me to trash it. As much as I was touched by her sweet gesture, I couldn’t help but burst into laughter during the last bit!